I am interested in history. I am particularly interested in ancient history; in point of fact, I have a degree in the subject. You want a boring monologue on liminal ritual within the Roman games? I’m your girl. Or at any rate, I was immediately post-dissertation, some 12 years ago. Given that Bath has a cracking example of, durrrr, Roman Baths, nicely preserved, you’d think I’d want to take my time and have a really good mooch round? Ordinarily: big fat yes; yet I skidded through those baths quicker than a ferret down a trouser leg. We really shouldn’t have gone away at all. Child wasn’t well to begin with, and I knew, I just knew in my water that this holiday was ill-starred. We had hardly arrived when his grizzle-factor rose considerably, closely followed by his temperature. 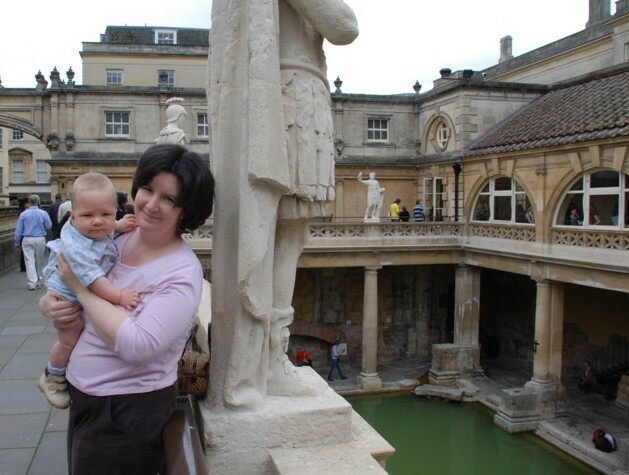 He was a boiling hot grumpy-trousers with sore eczema and sleepless parents on Monday morning, but dozed off in his pushchair towards lunchtime and we thought the time was ripe to visit the Roman Baths. Only after we had forked out our £14 each for a combined ticket to the Baths and the Fashion Museum did we realise that the pushchair could go no further than the entrance: some baby carriers constructed of shipyard-grade steel and several acres of tent canvas were proffered. I was all for getting our money back and retiring immediately, but John was keen to press on and elected to carry Harry in his arms. This worked well for, ooooo, about 3 minutes, before the fractious little chap began to wail steadily. I have an absolute horror of my child crying loudly in public, and his ululations were echoing around the lower walls and bouncing back to us like a perfectly-delivered yodel. I took fright and accelerated forward sharply, only to run into the back of a inpenetrable tour group of French schoolchildren. Now, I have lived nearish Stratford Upon Avon a long time. I have played Misdirect-The-Impolite-Tourist since childhood. Come visit, do! I have grown up to be a connoisseur of tour groups and their obstructive pavement Brownian motions; French teenagers are my least favourite by a wide margin. So, if I can arrange it, now I am often equipped with a useful propulsive weapon, they are Dust Beneath my Chariot Pushchair Wheels. Alas, my battering ram had been taken from me, and I had to resort to the good old-fashioned British Elbow. Pulling John and Harry in my slipstream, I stormed through a visitor attraction that is recommended as a 2 hour visit in less than 20 minutes, and 10 of those were spent taking photos of Harry. Once out of the door and into both his pushchair and the surprisingly warm May weather, Harry ceased to wail, and contented himself with looking moodily at the pigeons. he expressed vocal disapproval, necessitating another swift exit. And so it continued around Bath, until we gave up and went back to the cottage. At 4.30am I woke to find him positively incandescent at 39.4 degrees, so plonked him quickly into a tepid bath; John sponged him down gently whilst I, panic-stricken, phoned A&E in Bath, then NHS Direct. The latter call whipped me straight back to SCBU bossy-hell when the Voice On The Phone sniffily told me that tepid sponging was Not Recommended, could I Please Take Him Out? But she had taken so bloody long fussing over the fact that I didn’t know the exact address I was calling from that 25 minutes had already gone by and Harry was already out, dried, a whole degree cooler, and giggling. So Up Yours, Voice On The Phone. John and I sat over our sleeping baby until dawn, calming down from our fright. During breakfast he began to cook again, so we took him to the Walk-In NHS Centre. To their credit: as soon as they heard ‘39.4, bright red rash, premature and hole-in-heart’, we queue-jumped immediately in to see the lovely sensible nurse, who prodded his rash carefully, reassured us it was fading nicely under pressure, but arranged a GP appointment anyway. By the time we had driven out to the on-call-to-tourists-this-week surgery, Harry was hot as fire and proceeded to roar mightily throughout his appointment. GP not phased by rash or temperature per se, but didn’t like it in conjunction with premature hole-in-heartness much, and promptly despatched us to the children’s ward at Royal United Hospital. He mentioned pneumonia, which worried me rather. I never thought I’d see my son on a sats monitor again. But at least this time he was perky enough to kick the plaster straight off his toe. Good lad. Of course, by this time the various anti-pyretics had kicked in: Harry was ready for his lunch, and said so. The horns of my dilemma were now pointy and unpleasant, as I had not anticipated a long slog round the wrekin and had prepared him no lunch. So: I had to chose between letting my poorly sick son go hungry, or feeding him his first ever jar of baby food at nine months. Bugger bugger bugger. He had the jar of bland slop. He had the tact not to look as if he enjoyed it. He beamed nicely at the paediatrician, peed obligingly into the tube, and was pronounced free to go. We drove back to cottage, flung our belongings into the car, and came straight back home. Minor disasters awaited us here, but more of that anon, coz my posts are on course to be the longest, windiest ever in the world, and I Is Tired Tired Tired. Hope bub is on the mend and you can all relax a little. And enjoy the rest of your time away.